This recipe features all of the amazing produce that is growing right now. Eating seasonally feels so nourishing and satisfying! 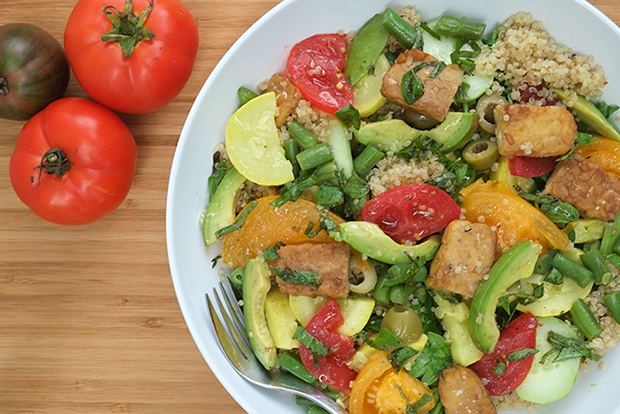 The great thing about this Summer Harvest Bowl is that you can make it your own. Add the summer vegetables, herbs and toppings that you and your family like. 2Marinate the tempeh in some tamari for a few minutes and add to hot pan with coconut oil. Once one side is brown flip over to the other side. 3Gather your vegetables, cut them up and sauté in coconut oil, some salt and any cut up herbs. 4Cut up the toppings: olives, cucumber, arugula, tomatoes. Other ideas: walnuts, goat cheese, sprouts, raisins, pine nuts, spinach, roasted garlic. 5Make dressing: Combine olive oil, lemon juice, fresh herbs, salt and pepper. 6Arrange in bowl (this is the hard part for me!) or just pile everything together. Pour dressing on top. I like to toast the quinoa with fresh herbs before adding water. To toast, add quinoa and herbs to a pan on medium heat. Stir occasionally, once the quinoa is slightly tan, or popping, add water. Be careful with this step, the quinoa will be hot and sputters out of the pan when water is added. Add the water slowly.